The notification bar only shows the time and battery status on the right side, nothing else (like WiFi, cellular signal, bluetooth etc. ), no matter if it’s turned on or off. It also doesn’t show the flight mode symbol. The built-in file manager showed nothing. Like, literally not a single file or directory or storage space (internal/SD) when swiping from the left edge. Several apps (such as the timetable app from my university) that worked before the upgrade disappeared and Yalp Store tells me they are incompatible to my device. A couple of weeks later, every sensor of my phone (accelerometer, compass etc.) doesn’t work anymore which results in e.g. the screen not turning when I hold the device horizontally. I already tried to reinstall the OS via the updater, update to the newest beta (19.something) and installing 18.10.0 (the official release) via the fastboot flashing zip. The latter seems to have solved the issue with the file manager, the others are still there. While I already thought about switching to LOS, I can’t, because TWRP fails to make a backup (at ~95% it stops at the “Creating digest” step and after 5-10 minutes I cancelled it). Which TWRP version are you using? The older one bundled with the OS, or the current one from twrp.me? 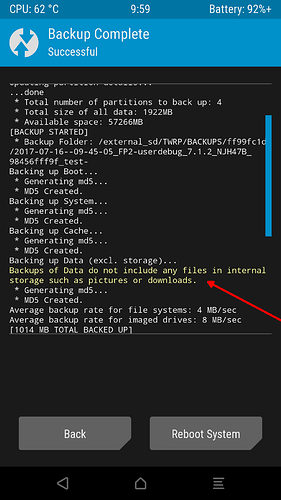 Be aware that TWRP does not include your data in Internal Storage in its backup anyway. A TWRP backup is mainly a backup of the state of the installed OS.